We shot Joshua tree close-ups to wide angle landscapes. I knew he was right on because a part of my professional life included photo assignments ordered by my newspaper section editor when the trained photographers were unavailable. Again, I had to buy a “real camera” (35mm) and learn how to use it. Trained photographers and editors taught me what I know today. Those were the days of canvas camera bags lumped with rolls of ISO 400 black and white film, proof sheets and a loupe. For cover photos we shot with slide film, developed the slides and slipped them into sheets of pocketed plastic to view. The real magic happened beneath a red light in the darkroom. Jumbles of rocks demand some black and white treatments at Joshua Tree National Park. I can now say, I shot this in RAW. Many terms remain, but a litany of technical and non-technical slang (selfies—which back in the 80s was something one might perform alone in a room) bombarded me with my new camera’s manual. It may as well been written in ancient Greek. What does he mean high-resolution? They aren’t in high-resolution? They have to be? What did I do wrong? In turn, I sent out panic emails to working photographers with a blood curdling subject line—like I’m going to have a heart attack or something. Within 3 hours I learned about RAW vs JPEG, need for Dropbox, Lightroom, blah, (still panicked), blah. I know JPEG, and had recently discovered RAW settings on my camera. But, frankly, the word RAW scared me to death. Four of the eight discussing how to best manage the hot spots from mid-day lighting. This is when I feel very old and out of touch and wish that some technology remain un-invented. It’s like the smart television that makes me feel like a dumb human. Fortunately, the day after my near and RAW meltdown, I met with seven other women for a 3-day photo journey in the desert. This gathering of Old Broads With Cameras (OBWC) included photography undergrads, artists, and hobbyists. Our ages ran from 50-something to 70-something. Some in fabulous shape, others working on fabulous shape. After settling into the Desert Hot Springs house we rented, there was one thing we agreed upon, digital technology changed most everything we knew back in those good ol’ days of ISO 400 B&W film for 35mm cameras. But we loved the potential. Yes, we remained on a learning curve. Yes, we would hike, but not on difficult and long trails. Yes, we wanted to test our photo chops with predawn photos in the desert. Yes, we would have a good time. 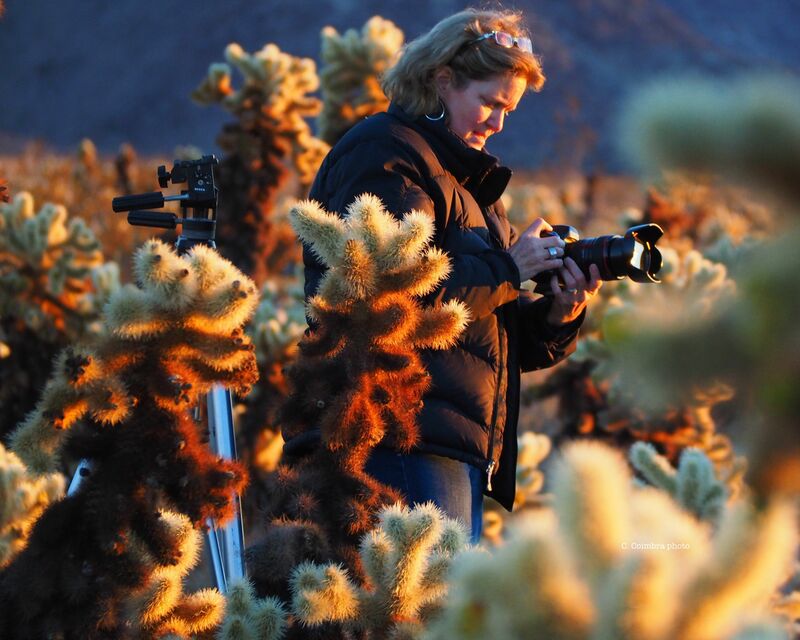 Some camera adjustment for the changing sunrise in the Cholla Garden at Joshua Tree National Park. Tripods, water bottles, and back packs weighed down my car. 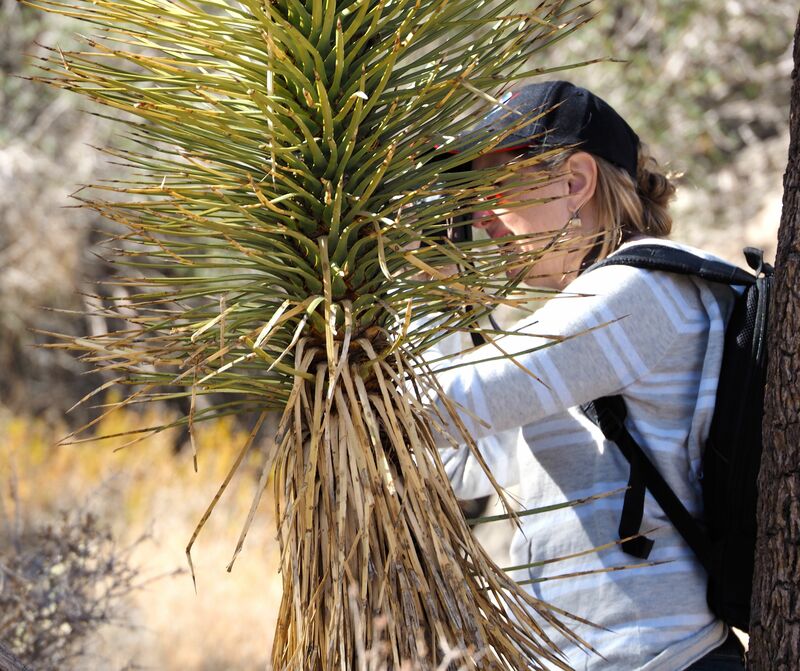 OMG, I was in creative women heaven as we laced our hiking boots, hung cameras around our necks and hitched backpacks to our bodies and began our first trek along a moderate trail in Joshua Tree National Park. A few of our crew brought their sketch pads and paints for some plein air fun. Each woman wandered at her own pace and let her creative eye go buck wild. Limitations be damned! Just shoot it! After our mountain top sunset photo shoot, exhausted and hungry, we returned to our 4-bedroom rental, slipped our photo cards in to our Macs and ewwed and awwed at each other’s compositions. Together, probably a 1000 or more frames. The next day included a predawn and sunrise photo shoot. This was far from my personal photo taking experience. I studied the how-to and prayed I’d retain the info. I didn’t come home with a money-maker predawn photo, but I’m pleased with my first attempt. It was the support that made all the difference. No one played know-it-all. Everyone agreed we each had something to learn and share in this digital world of photography, and we’re not afraid! Personally, I applaud myself for giving me the best birthday present ever—that semi-professional DSLR—even if I’m still digesting terms like, 16.3MP Live MOS Sensor, and Micro Four Thirds System. It’s a fresh view on creativity for this OBWC. Love It! You have such a gift for words. I am so happy to have had the experience with you all.